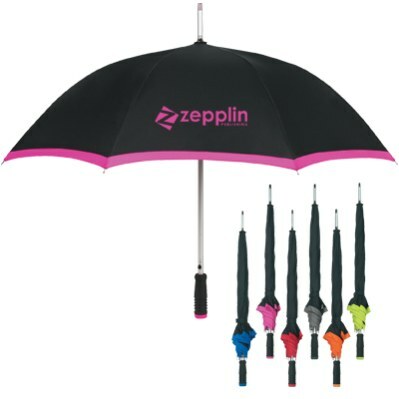 Personalized Deluxe Umbrellas Custom Printed in Bulk. Promotional, Budget priced, made of Pongee Material. 46" arc, Two Tone. Bulk Deluxe Pongee Umbrella with aluminum frame and windproof construction. Budget Prices in USA and Canada for wholesale fashionable pongee umbrellas. Free artwork design. We will send you a proof for your approval before production.